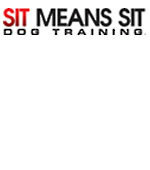 Sit Means Sit is the quickest, most effective way to have the happy, confident, obedient dog you've dreamed of! Our goal is to help you gain the maximum control of your dog, both on and off the leash, while still allowing your pet to "act like a dog." We provide just the right combination of in home private lessons, Board & Train Immersion programs, and group distraction classes, customized to meet your particular needs.